KIEV, Ukraine -- The Ukrainian government said on Saturday that it had proof that Russia had provided the surface-to-air missile system that shot down a Malaysia Airlines passenger jet over eastern Ukraine on Thursday, killing all 298 people aboard. 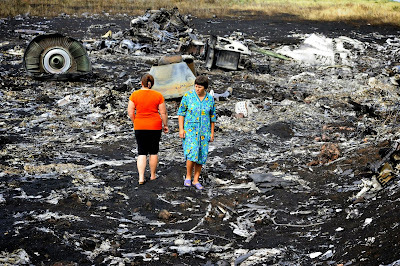 Local Hrabove residents are seen scavenging the crash site of MH17. That claim came as officials from Malaysia and the Netherlands pleaded for politics to be put aside so they could recover their dead, still lying in a field in a war zone. Ukraine also accused Russia and separatist rebels in the east of trying to cover up their role by blocking recovery workers from the crash site, removing evidence and driving three missile launchers back to Russia just hours after the crash. At a news conference in Kiev, Vitaly Nayda, the head of counterintelligence for the Ukrainian State Security Service, displayed photographs that he said showed the three Buk-M1 missile systems on the road to the Russian border. Two of the devices, missile launchers mounted on armored vehicles, crossed the border into Russia about 2 a.m. Friday, or less than 10 hours after the jet, Flight 17, was blown apart in midair, he said. The third weapon crossed about 4 a.m. Mr. Nayda said that the missile had been fired from the town of Snizhne, in rebel-controlled territory, echoing American intelligence showing the missile coming from eastern Ukraine. Both the Ukrainians and the Americans said they believed that the separatist rebels would have needed help from Russia in order to fire such a weapon. Tensions flared on several fronts on Saturday with reports of heavy fighting between rebels and government forces in the eastern city of Luhansk, a reminder that the crash site is in an active combat zone. Meanwhile, the Kremlin announced that it was imposing economic sanctions on 12 Americans in retaliation for a new round of economic sanctions announced last week against Russian companies. The allegations of a cover-up, both to hide the weapons in the hours immediately after the missile strike and to stop investigators from collecting evidence, threatened to inflame an already highly charged event. Officials from Malaysia and the Netherlands, which had the most citizens aboard the plane, urged that the crash site be secured and that recovery operations be allowed to proceed. Prime Minister Mark Rutte of the Netherlands said at a news conference that he asked President Vladimir V. Putin of Russia to persuade the rebels to release the bodies and stop “messing around” with the crash site before European forensic inspectors could examine it. “I told him that the entire country is desperate,” Mr. Rutte said. 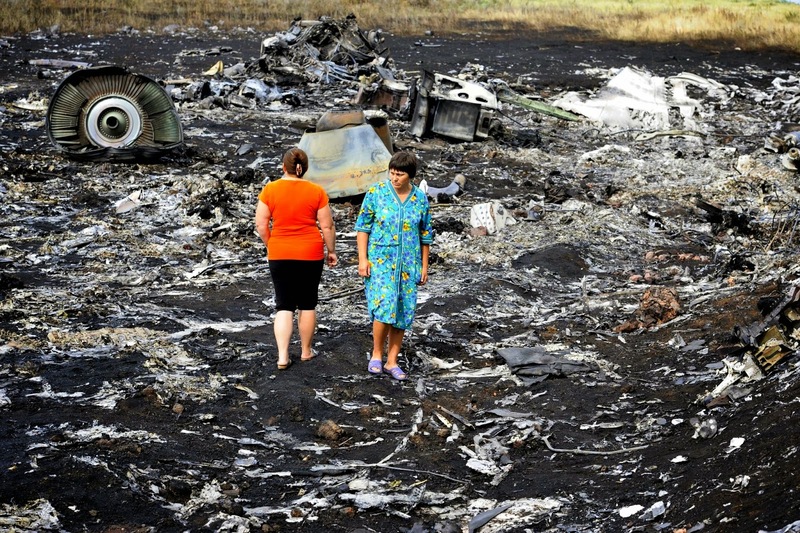 “Days after the plane went down, the remains of 298 people lie uncovered,” he said. In Kiev, officials said there was still no clear information about the location of the flight data recorders. They were said to have been recovered at the scene but then taken by rebels. On Friday, rebels said they had the recorders and would turn them over to international investigators. On Saturday, however, a rebel leader, Alexander Borodai, said that the devices had not yet been found, local news services reported. The Kremlin has forcefully denied any role in the downing of the plane and has gone on the offensive, saying that the Ukrainian military’s antiaircraft weapons may have been responsible. Ukrainian officials called for an international investigation. “We have proof that the terrorist attack was planned and carried out with the involvement of representatives of the Russian Federation,” Mr. Nayda, the intelligence official, said. Russian officials have stopped short of directly pointing a finger at Kiev, but they have issued their own calls for a thorough international inquiry. In Malaysia, where officials are grappling with the tragedy of losing a second major jetliner this year, the government has joined the call for an investigation but is reluctant to assign blame for the crash. Experts and officials said two concerns shaped the Malaysian government’s wariness: its bruising experience with confusion after the loss of Malaysia Airlines Flight 370 more than four months ago, and a desire not to alienate Russia and China, its main partner in East Asia. The Ukrainian government charged that rebels had moved at least 38 bodies of victims to a morgue in Donetsk, a regional capital and rebel stronghold. Officials had planned to take victims to Kharkiv, a city in the east outside rebel control, and where they said a special lab would help identify remains. On Saturday afternoon, it was not clear who was in charge at the crash site. Journalists were restricted from entering certain areas, at times by a man in fatigues who occasionally made his point by firing a gun into the air. He wore a badge from the general prosecutor’s office. Tents had been set up as a headquarters, but emergency workers said they did not know who was in charge of plane parts. Alexander Yakubovsky, an official in the general prosecutor’s office in Donetsk, confirmed that rescue workers had removed some bodies but said that they were only those that had fallen into homes and courtyards, about 30, and that they had been taken to the morgue in Donetsk. Donetsk is controlled by rebels, but the loyalties of the officials at the site on Saturday were not clear. Mr. Yakubovsky said that his office had a small team of investigators at the crash site, but their role was not clear. He would not comment on allegations that rebels have blocked federal investigators from Kiev. In Kiev, Andriy Lysenko, a spokesman for Ukraine’s National Defense and Security Council, said that officials believed rebels were blocking access in order to remove missile fragments that would help prove that a Russian missile destroyed the plane. He said officials from the state Emergency Services Ministry, the Interior Ministry and the general prosecutor’s office had been denied access. Senior Pentagon officials also expressed concerns about any loss of potential evidence, but voiced confidence that analysts would be able to work around that. Borodai, a Russian citizen who is a self-appointed leader of the separatist movement, has denied that rebels were interfering with the recovery operation. On Saturday afternoon, rescue workers in blue uniforms directed the collection of bodies from the fields where they fell, placing them on stretchers and into black body bags. A cluster of about 10 of them lay by the road, as men in pairs made their way through the grass, retrieving them. A supervisor, Aleksei Sergeyevich, who gave his patronymic but asked that his last name not be published, said that since 6 a.m. workers had gathered 190 bodies, some in pieces. He said that the recovery area had been more than doubled to 13 square miles from five square miles, and that 343 workers were participating in the effort, including volunteers and rebels. Monitors from the Organization for Security and Cooperation in Europe, who were denied access to the site on Friday, had been permitted to enter, an agency spokesman said, but it was not clear how long they had been allowed to remain. On Saturday, the Kremlin said Putin had spoken by telephone with Angela Merkel, the German chancellor, about the airliner investigation and the need to pursue a cease-fire in southeastern Ukraine. The two leaders agreed on the need for a “thorough and objective investigation of all the circumstances of the incident,” according to a brief statement on the Kremlin website. At a news conference in Washington on Friday, Rear Adm. John F. Kirby said that it would have been difficult for the separatists to have fired the missile, believed to be a Russian-built SA-11, without Russian help. Admiral Kirby also raised the possibility that the Russian military had driven the SA-11 system into Ukraine and even fired it. “It was a surface-to-air missile, an SA-11, fired from a location controlled by Russian separatists near the border,” he said. A senior American official said Saturday that the United States had no reason to doubt Ukrainian government statements that the SA-11 unit that fired on the plane had been seen heading back toward Russia.